Rare American Gold Eagles with Bullish Futures. American gold eagles were minted intermittently from 1795 to 1933. Not to be confused with the modern day bullion gold eagles of various sizes and weights, business strike gold eagle coins of yesteryear were of basically one size and carried a face value of ten dollars. Once again, our apologies to those who came to this page with the expectation of finding write ups on a dozen or so US gold eagles with bullish futures. As you can see, we've only got one date listed! There are plenty of them to choose from, to be sure. As is the case for all US gold coin denominations, rare dates of high numismatic significance (and thus evermore increasing values in the years to come) abound. Why aren't more bullish recommendations listed here, on this page? It was our intention that any coin highlighted in this section be accompanied by a feature called "The Year This Coin was Minted...", in keeping with the secondary goal of this site, which is to connect history with coins (yes, anytime you hold a coin from long ago, you're holding history in your hands!). It does take some time to research and prepare the history lessons embedded in our Bullish coin chapters, and for the $10 gold eagles, we've just got one lonely placeholder, the 1907 Wire Edge Indian Head. More will be added with similar gusto, we promise! No one should click away from here in disappointment, however. There are plenty of bullish recommendations for $10 gold eagles, as well as all other US coins (sans the history lessons). You may obtain this free buying advice by studying the coins tracked in our Rare Coin Values Index. Many more dates with exciting potential (based on factual data from the past) may be found in the key date analysis included with every category presented in the US Coin Types section. Indian Head American gold eagles were produced from 1907 to 1933. Viewed as a great artistic success, surprisingly very few gold eagles of this series have demonstrated positive returns over a long period of time, and those that do barely made the cut. The very first Indian Head gold eagle minted was the 1907 "wire edge" variety. Normally, US coins featured a raised rim around the circumference of the coin, but these issues simply had rounded edges. Unfortunately, "wire edge" coins did not stack neatly, so the variety was discontinued, but not before 500 pieces were struck. If you like this series and are looking for future potential, then this date and variety is a good bet. Prepare to spend a bundle of dough to get started. Focus on specimens grading XF-40 to MS-63. At the dawn of the 20th century, immigrants from Japan were reaching the American west coast in ever-larger numbers. Gradually, fear of economic competition and cultural clashes led to a climate of "Yellow Peril", followed by ugly anti-American demonstrations in Japan. To ease tensions between both nations, President Theodore Roosevelt in 1907 convinced California officials to rescind segregation laws targeting Japanese and other persons of Oriental heritage. In return, Japan agreed to severely restrict emigration to the US. The "Gentlemen's Agreement", as the deal came to be known, diffused the volatile situation, but did little to improve the long-term relationship between the US and Japan. Other events from 1907: Oklahoma admitted to the Union as the 46th state, and the second Sunday in May celebrated in Philadelphia as Mother's Day. 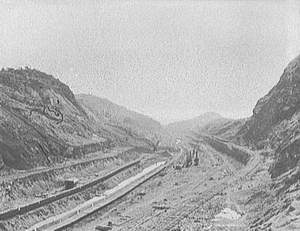 In 1907, President Roosevelt turned over construction of the Panama Canal to the US Army. The Culebra Cut, shown above, sliced through Panama's mountain range, one of many difficult obstacles overcame during the building of the canal. Malaria and yellow fever claimed the lives of thousands of laborers before Army doctors developed successful vaccines against the lethal diseases. When the canal was opened for shipping in 1914, it was recognized as one of the greatest man-made achievements in the history of the world.